ECM have excelled themselves yet again with this beautiful recital disc from Natascia and Raffaella Gazzana. If the programme list looks a bit random, the sheer conviction of the players in making it all add up means that there is little or no discontinuity between works. And while each of the composers, Takemitsu, Hindemith, Janacek and Silvestrov, inhabit separate musical worlds, these four works are at the more laid back end of each man's aesthetic. The French title of Takemitsu's Distance de fee is telling. The work was written the in the early 1950s, when the composer was just 20. The accepted wisdom on Takemitsu's early career is that he was writing Messiaen-esque French music until John Cage introduced him to the music of his native Japan. This piece certainly bears out the idea that Messiaen was a major early influence. In many ways, this short work is similar to the early music of Morton Feldman, in that it is relatively conventional but hints at the scope and individuality of the composer's later work. An interesting discovery, and certainly worthy of broader attention. If the names Takemitsu and Hindemith seem strange appearing together in the same sentence, the transition from the first man's work to the latter's Violin Sonata shows that they have more in common than you might think. In fact, it takes two or three hearings even to pinpoint exactly where one ends and the other begins. 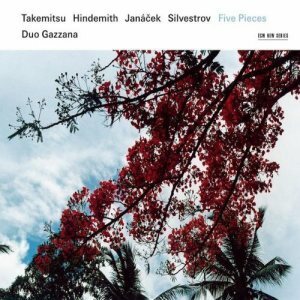 The programming here is brilliant, with the tranquillity of the Takemitsu leading into the similar tranquillity of Hindemith's first movement, both of which provide an atmospheric background to the more tumultuous climax of Hindemith's second movement finale. Natascia Gazzana doesn't have a particularly round tone, instead her playing has a slightly nasal edge. Its not unpleasant, in fact the tonal focus is valuable in this 20th century repertoire. It is especially appropriate to the Janacek Sonata, in which it sits somewhere between a concert violin tone and the more edgy sound of the folk fiddles that inspired the work. That said, the Janacek does lack bite. It could do with more punchy accents and more gutsy rhythms. This more laid back reading allows the work to fit more easily into the relaxed programme, and into the "ECM sound", but also does the work an injustice. No such complaints with the performance of Silvestrov's recent Five Pieces. I'm not a big fan of Silvestrov's recent music, especially works like this that rely on an unashamedly 19th century Russian Romantic aesthetic, with added echo effects and such like to represent time and nostalgia. Nevertheless, the performance here, and the context, give the music more appeal. I'm reminded of Arvo Part, perhaps it is not quite as repetitious as Part, but like him Silvestrov give the performers plenty of space to shape the music themselves and introduce their own emotive twists. Given the continuity of the ECM brand, the company must rely on loyal buyers to keep their classical projects afloat. Those buyers are not going to be disappointed by this release, which has everything going for it of the company's best work. I do wonder about the performers though. Presumably Manfred Eicher lays down the law in A&R matters, and probably also in matters of interpretation too. No doubt you have to give up a good deal of musical autonomy to work with ECM. But as this disc amply demonstrates, the sacrifices are worth making.